Helen Hershkoff will be teaching the course “Introduction to U.S. Law. “ A member of the NYU Law faculty since 1995, Hershkoff was honored with the NYU 2014–2015 Distinguished Teaching Award, recognized by the Association of American Law Schools as a 2013 Teacher of the Year, and received the Law School’s 2013 Podell Distinguished Teaching Award. Her scholarship focuses on courts and procedure, as well as constitutional law and its relationship with private law. 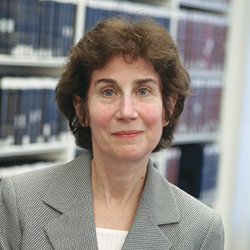 She is a co-author of the leading casebook on civil procedure, a co-editor of an admired book on comparative civil procedure, and a member of the author team of the leading treatise on the federal courts, with a focus on the United States as a party. Hershkoff’s scholarship has been published in Harvard, Stanford, NYU, and other leading law reviews. Before joining the NYU Law faculty, Hershkoff worked as a litigator for almost two decades, first as an associate at Paul Weiss Rifkind Wharton & Garrison, then as a staff attorney at The Legal Aid Society, and finally as an associate legal director of the American Civil Liberties Union. Hershkoff earned her BA from Harvard College, where she was elected to Phi Beta Kappa in her junior year, holds an MA in modern history from Oxford University, which she attended as a Marshall Scholar, and a JD from Harvard Law School. She graduated from Erasmus Hall High School in Brooklyn, NY.